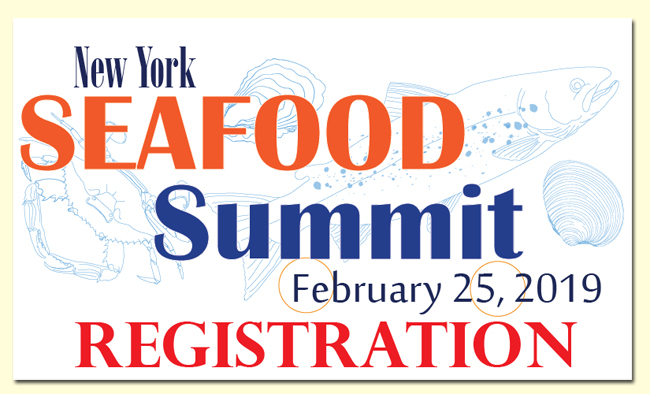 New York, NY, December 5, 2018 - NY Sea Grant in collaboration with industry, academic and other professional seafood stakeholders would like to invite you to participate in a “NY Seafood Summit.” The goal of the summit will be to convene a group of enthusiastic professionals with vested interest in seafood, in order to build active communications between the various sectors of the NY Seafood Industry. At the summit we plan to review progress and achievements since our last summit in 2018 and discuss a variety of relevant topics surrounding seafood in NY State. Through these discussions we hope to identify specific focus areas, which the group can target to achieve the mutually beneficial goals of promoting and protecting the seafood and seafood resources throughout NY State. These goals will be attained through the development of active communication and sharing of resources among the various entities of the NY Seafood Industry.